Foundations are my most purchased makeup item, I just cannot get enough. I think it's because I've never had the best skin so looking for the "perfect" foundation has always been an aim for me. I thought I would give you all a run through of my favourite four foundations, when I use them and who I would recommend them for. 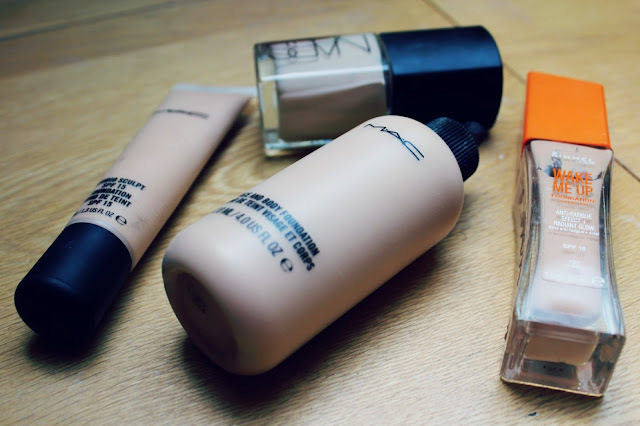 Firstly I'm going to start with the Mac Studio Sculpt foundation, my shade in Mac foundations is NC20. I'm not entirely sure how I would describe the consistency of this foundation, it's a gel but also a mousse but more of a gel, did you get that? I never make a lot of sense, but it is a formulation I've never tried before. I would say the coverage of this foundation is medium to full but more on the full side. I love foundations with more coverage so this is perfect for me, I like to use it with my Real Techniques Expert Face brush, when I first started using this foundation I used the Buffing Brush however as the EFB is denser and the foundation is thicker than most I found the EFB worked better for blending it in. As my skin has not been behaving lately this foundation has been perfect as it gives a flawless, perfect base if you are looking for a foundation with more coverage. 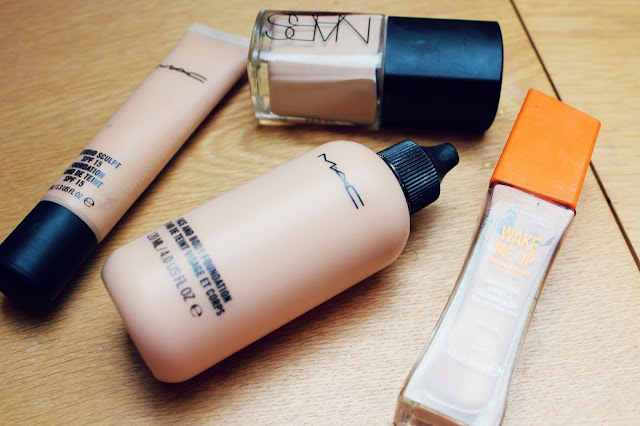 Staying with Mac, I absolutely love the Face and Body Foundation. I bought this last year before my holiday, it was perfect as if you apply a small amount the coverage is light and feels like you hardly have anything on. The great thing about this foundation is that the you can add and add and add foundation to build coverage without it looking cakey and the more you work the foundation into the skin, the more coverage you can get. I find that with some foundations if you get one shade lighter or darker you cannot wear the foundation however with face and body it doesn't matter too much is you pick a shade too light or dark! I bought this online and guessed the shade, luckily it was right but it wouldn't matter too much either way! The next foundation I love is the Nars Sheerglow Foundation, I am in the shade "Mont Blanc" in case you were wondering! I would say this foundation is medium coverage which is usually just about right for me if my skin is behaving! I have only tried two products from Nars (recommend some more in the comments as I would love to invest in some more!) but I have loved them both, this foundation just gives the nicest finish, it doesn't cling to the dry patches on my face and doesn't accentuate any parts that get oily throughout the day, (darn you combination skin!) although this foundation is a teeny bit pricey I do think that it is worth it! Finally is a nice cheaper alternative, the Rimmel Wake Me Up Foundation. The coverage of this is similar to the Nars Sheerglow so is one I reach for quite a lot. I think I got one shade too dark but it's not too much of an issue, I just remember to blend down my neck! I think this is one of the best drugstore foundations I have tried (and I've tried a fair few!) it has great coverage, great price, great finish! As with quite a few drugstore foundations, the shade range is not the best and it doesn't cater for pale skins or dark skintones which is a shame as it is a really great foundation! I always love trying new foundations, which would you recommend? I really liked Revlons photo ready foundation but since they've turned not cruelty free I'm a little disappointed! I tried Rimmels wake me up foundation but found after a few times of wearing it my skin started to look quite dry and dull....I reviewed this on my blog and a lot of my readers weren't happy that they couldn't find the ingredients for this product too! M.A.C I LOVE....but again not too happy that they're no longer cruelty free *sob* I loved this foundation until I had the worst reaction to it and was completely put off....I do like their face and body foundation though...I found this lighter on my skin!? hahaha sorry for the long post! I've tried MAC Studio Sculpt and am currently using Rimmel Wake Me Up. Studio Sculpt is awesome and a clear favourite along many but Wake Me Up is awesome for a drug store brand! I love Studio Sculpt for nights out and occasions, it has great coverage! I really want to try MAC's face and body! You should totally try Jouer's Matte Moisture tint (the lumizing one is amazing too if that floats your boat) - I loveeeee it! The Nars blushes are a must have! I also love their Satin Lip Pencils and their eyeshadow duos. I'm with you on Wake Me Up being one of the better drugstore foundations! Never tried any MAC or NARS foundations but I'm considering a MAC one. I love Studio Sculpt but currently I have been loving Bourjois Healthy Mix Serum. No 7 foundations are great! I wanted to try the Rimmel wake me up foundation because I'd been hearing a lot of good reviews about it,too bad it wasn't available here in UAE. do you not think the rimmel foundation is too glittery? more of.. non dewy?